As Lewis Hamilton celebrated his fifth championship, and yet more riches, in the breathless Mexico City air, it was a world away from his humble beginnings on a Stevenage council estate. 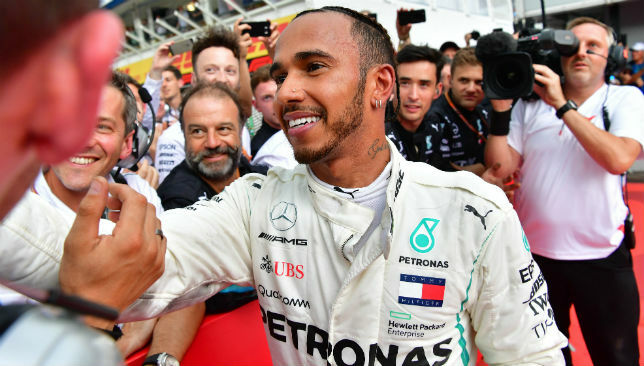 It is easy to forget, now that he has earned a fortune of some £170million and emulated Argentinian great Juan Manuel Fangio’s tally of titles, quite what a trailblazer the young Hamilton was. Breaking down racial barriers during a prodigious career as a junior karter, he summoned the courage to seek out McLaren boss Ron Dennis. Hamilton did not have to wait that long. Just three years later, he signed for McLaren and was provided with a magic carpet into Formula One as the most prepared driver in the sport’s history. Once there, he would build on the natural talent drawn from his early career which was funded by his father Anthony, who worked four jobs to set his son on the path to greatness. On his debut in 2007, Hamilton became the first black driver to race in Formula One’s white-dominated world. He dazzled under Australian skies, before recording his first victory in June at the Canadian Grand Prix. Remarkably, he came within a single point of winning the championship in his debut year. Twelve months later, and in typically dramatic style in Brazil, the moment arrived. Hamilton sealed his maiden title at the last corner on the last lap in the last race of the year. He continued to notch up victories, 21 in all with McLaren, but a second championship would elude him there. The team were unable to provide him with a car quick enough to take the challenge to Sebastian Vettel, and Hamilton jealously watched on as Vettel reeled off four championships in a Red Bull superior to his McLaren machinery. Disillusioned by failure, Hamilton, who had by now severed managerial ties with his father, considered walking away from the sport. He then took the brave decision to join Mercedes. 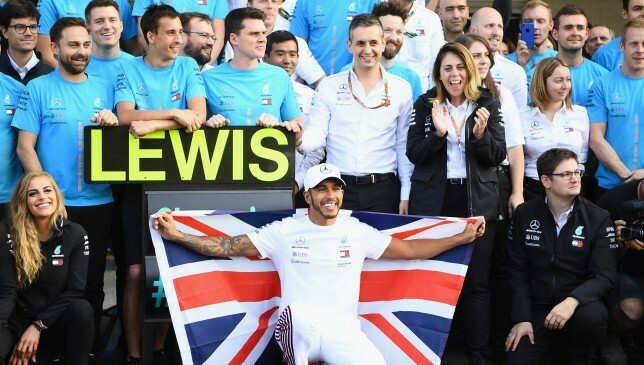 It was his move to the Silver Arrows which would act as a prelude to the almost unprecedented run of success which has seen Hamilton take four of the last five championships, win 50 further races, and stand alone as the man with more pole positions (81) than anyone who has gone before. Increasingly a fixture of the celebrity scene, and the most recognisable F1 superstar since Michael Schumacher won five consecutive championships with Ferrari at the turn of the century, Hamilton would meet his nemesis in the form of his old karting team-mate Nico Rosberg. Although Hamilton would claim his second and third championships in 2014 and 2015, Rosberg would become the only man to beat him over a meaningful season. And, perhaps fearing he may never be able to reach such lofty heights again, the German retired just days after his 2016 triumph, denying Hamilton the chance of revenge. His vengeance would instead come against another German. Vettel had now ditched Red Bull for the allure of Ferrari. Their battle was billed as a mouth-watering cocktail of the two most decorated drivers of their generation going head-to-head, but it was Hamilton who had more ice in his glass. Just as in Mexico in 2017, the Briton, aged 33 and two decades after he signed for McLaren, was on Sunday crowned king of the world with two races to spare. Earlier this year, Hamilton signed a contract to become F1’s first £40million-a-season driver, staying at Mercedes until 2020. And suddenly, Schumacher’s haul of seven titles – one many thought would never be equalled – is now firmly in sight. Here, we take a closer look at the drivers in whose company Hamilton finds himself. Fangio was among Formula One’s founding fathers, competing in the 1950s when death was synonymous with the sport. Considered by many as the greatest of all time, Fangio, known as El Maestro, won five championships in just six seasons. A feather in his cap was that he uniquely won those titles with four different constructors: Alfa Romeo, Ferrari, Mercedes and Maserati. His team-mate, Sir Stirling Moss, still says he is the best driver ever. Before the United States Grand Prix, Hamilton described the Argentinian – who died in 1995 – as F1’s godfather. His record of five championships stood for nearly half a century. The German won seven championships, two with Benetton in 1994 and 1995 and then an unprecedented five on the spin for Ferrari at the turn of the century. A controversial driver, he collided with Damon Hill and Jacques Villeneuve at the 1994 and 1997 championship deciders, before he deliberately parked his Ferrari at Monaco in 2006 to prevent Fernando Alonso from setting a lap in qualifying. He galvanised Ferrari following his move from Benetton, and his total of 91 victories is 20 greater than any driver, with Hamilton next on the list. 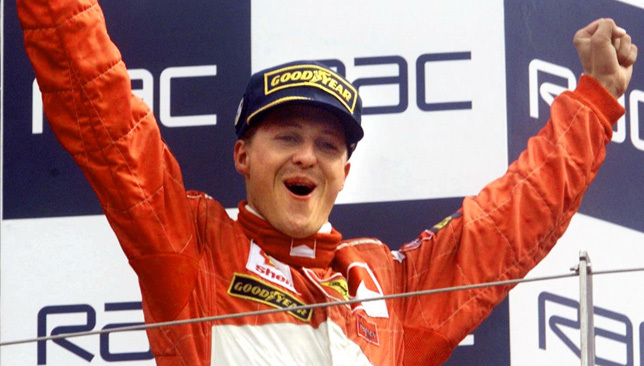 Little is known of Schumacher’s current medical health following a skiing crash on holiday with his family in the French Alps in 2013. Lewis Hamilton will celebrate winning the world championship with his dogs in Los Angeles, the triumphant Briton revealed on Sunday night. Hamilton made hard work of the fifth title that draws him level with Juan Manuel Fangio, and just two short of Michael Schumacher’s all-time record, after a nervous Mexican Grand Prix. The Mercedes star, 33, started well but he was passed by Ferrari’s Sebastian Vettel, and then ran off the road while battling for position with the Red Bull of Daniel Ricciardo. 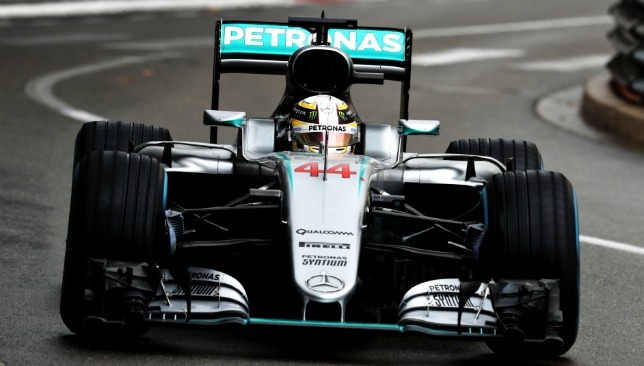 But Hamilton took the chequered flag in fourth to secure the championship with two rounds to spare. The Englishman performed a series of celebratory doughnuts in his Mercedes for the 40,000-strong crowd in the former baseball stadium section of this unique Autodromo Hermanos Rodriguez venue, before standing on top of the car to salute them. 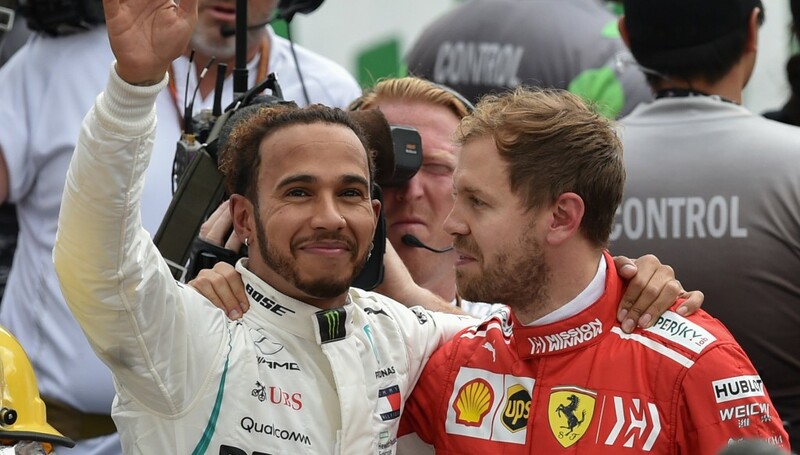 Vettel, who finished second behind winner Max Verstappen, then sportingly broke away from his post-race television interview to embrace Hamilton. Sebastian Vettel was gracious in defeat. 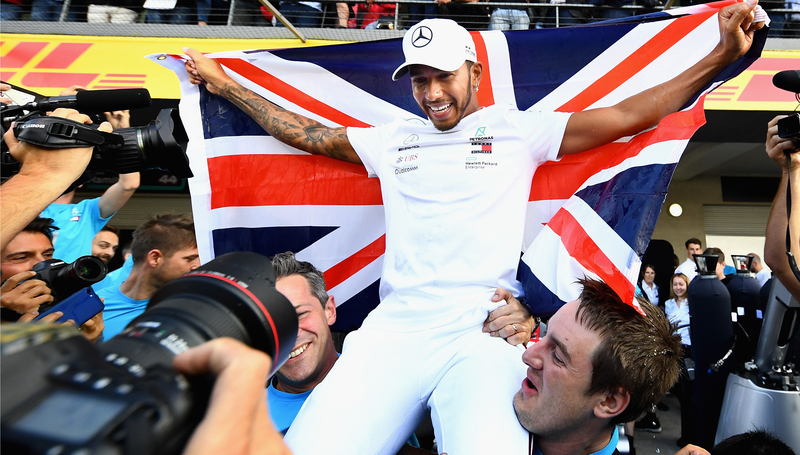 Asked how he intended to celebrate his triumph, Hamilton replied: “It is going to sound really boring, but I just feel content and really happy, so I am looking forward to going to sleep. “Tonight, I will leave this beautiful country, and I am looking forward to seeing my dogs, Roscoe and Coco, who live in LA. The unconditional love of a pet is something quite special. Hamilton’s victory parade will now begin in Brazil, a week on Sunday. While the race here may not have gone to script for Hamilton, Vettel has been unable to live with his rival during the second half of a spellbinding campaign by the Mercedes man. Vettel delivered his best drive since the summer break on Sunday, but it was a case of too little, too late for the German, whose championship challenge has been defined by a series of mistakes. “Lewis drove superbly all year, and he was the better one of us two,” said Vettel, who visited the Mercedes’ nerve centre in the paddock to congratulate the team following Hamilton’s triumph. “Number five is something incredible so I told him to enjoy it, and keep pushing as I need him to be at his best for us to keep fighting again next year. “It is a horrible moment for me. Three times in my life I have had that disappointment when you realise you can’t win the championship anymore and they are not happy days.